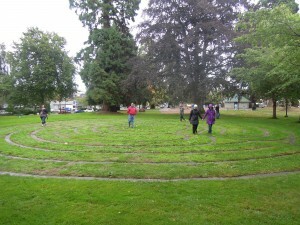 Sept 16th — A gathering and Labyrinth Walk in James Bay to celebrate Greater Victoria Labyrinth Friendship Day & Irving Park Labyrinth. Officially named ***Irving Park Labyrinth this year with new signage from the City of Victoria! Join us for an evening walk at Irving Park. Hosted by Church of Truth Oneness Wednesday and Renee Lindstrom of Labyrinths of Greater Victoria. Refreshment provided. Donations appreciated. More info: www.walkvictoria.wordpress.com. A community candlelight labyrinth walk at Irving Park Labyrinth Pathway to harmonize with the fall equinox. A beautiful balance of walking with an inward focus to connect with self and the element with others holding the same purpose! Betsy Nuse and Louise Taylor will be joining us at Irving Park Sept 13rd: Inspired by a global call to join hands for peace with other circles in Europe, Australia and South America, Louise and Betsy will align our energies with the labyrinth and trees of Irving Park. We will move with one another in a variety of simple community dances. Bring only your openness to cultivating both inner and outer peace – no dance experience and no partners are required. Sept 27th — Life of Balance, Nature as the Guide to Living Nature in balance creates harmony and gifts all life with what they need for a happy life. Nature out of balance takes back its gifts and destroys life. Can exploring the metaphors of Nature guide us in our developing consciousness and take us back into living life in more harmony and balance with each other and our natural surroundings. As a labyrinth reflects an ancient natural form of going inward to find a connection to return differently lets continue the journey to exploring our nature characters and how to be more understanding in relationships using the virtues reflected in nature.